Oʻahu (usually Oahu outside Hawaiian and Hawaiian English) is the third-largest of the Hawaiian Islands and most populous of the islands in the state of Hawaii. 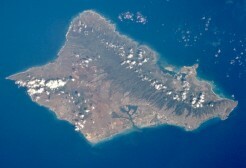 Including small close-in offshore islands such as Ford Island and the islands in Kaneohe Bay and off the eastern coast, it has a total land area of 596.7 square miles (1,545.3 km²). Since approximately 75 percent of the resident population of the state lives on the island, Oʻahu has for a long time been nicknamed "The Gathering Place." Ancient Hawaiian tradition attributes the name's origin to the legend of Hawaiiloa, the Polynesian navigator credited with discovery of the Hawaiian Islands. The story relates that he named the island after a son. The city of Honolulu, the largest city, state capital, and main deepwater marine port for the state of Hawaii is on Oahu. Honolulu was the site of the attack (at Pearl Harbor) by Imperial Japanese forces in 1941. The result of the attack led to America's entry into the World War II and the defeat of both Nazi Germany and Imperialistic Japan. Oahu’s North Shore is famed for big wave surfing during the winter months while Waikiki is known for its world-famous beaches. In greatest dimension, this volcanic island is 44 miles (71 km) long and 30 miles (48 km) across. The length of the shoreline is 227 miles (366 km). The island is the result of two separate shield volcanoes that today form two mountain ranges, Waiʻanae to the west and Koʻolau in the east. In a broad plateau between them farmers raise livestock, sugarcane, pineapple, and other crops. The highest point is Mt. Kaʻala in the Waiʻanae Range, rising to 4,003 feet (1,220 m) above sea level. Some of the most famous beaches in Hawaii line the coast. The island extends from Kaʻena on the west end to Makapuʻu on the east. Well-known features found on Oʻahu include Waikīkī, Pearl Harbor, Diamond Head, Hanauma Bay, Kāneʻohe Bay, and the North Shore. Oahu has a subtropical climate, and temperatures tend to be consistently warm year-round. The eastern coast is wetter, particularly in the November to March rainy season. Hurricanes may hit during the months of June and November. The only native mammals are bats and marine animals such as seals, dolphins, and whales. Because of the island's isolation, numerous insects, birds, and plants are found nowhere else. Orchids and other tropical flowers flourish in the rain forests. Waimanalo Beach on windward side of Oʻahu, Hawaiʻi. Mākua Valley military testing area, Oʻahu, Hawaiʻi. Oʻahu was apparently the first of the Hawaiian Islands sighted by the crew of HMS Resolution on January 18, 1778, during Captain James Cook's third Pacific expedition. Escorted by HMS Discovery, the expedition was surprised to find high islands this far north in the central Pacific. Oʻahu was not actually visited by Europeans until February 28, 1779, when Captain Clerke aboard Resolution stepped ashore at Waimea Bay. Clerke had taken command of the ship after Captain Cook was killed at Kealakekua Bay (Island of Hawaiʻi) on February 14, as he was leaving the islands for the North Pacific. The hono-lulu, or sheltered bay, became a stopover for ships sailing between the Americas and Asia in the nineteenth century. The arrival of whaling ships and missionaries accelerated settlement of the port city. Kamehameha III moved his capital from Lāhainā, Maui, to Oʻahu in 1845. ʻIolani Palace, built later by other members of the royal family, is still standing, and is the only royal palace on American soil. The opening battle of World War II in the Pacific for the United States was the Imperial Japanese Navy attack on Pearl Harbor on the morning of December 7, 1941. The surprise attack was aimed at the Pacific Fleet of the United States Navy and its defending Army Air Corps and Marine Air Forces. The attack damaged or destroyed 12 American warships, destroyed 188 aircraft, and resulted in the deaths of 2,403 American servicemen and 68 civilians. A series of earthquakes struck Oʻahu and the surrounding islands on October 15, 2006, interrupting electrical supplies and knocking television broadcasting stations off the air. Preliminary reports said that the first earthquake measured 6.3 on the Richter scale and originated 155 miles southeast of Honolulu. Valley of the Temples near the island's eastern shore. Honolulu is the crossroads of trans-Pacific shipping and air routes. Tourism is the largest industry. Agriculture includes pineapple and sugarcane plantations. The numerous manufacturing plants in Honolulu include pineapple canneries, sugar refineries, clothing factories, and steel, aluminum, oil, cement, and dairy enterprises. Several freeways and highways link Honolulu proper with other parts of the island. Honolulu International Airport is one of the busiest in the United States. Honolulu Harbor, with extensive docks, warehouses, and storage sheds, is the principal port of Hawaii. Oahu offers a variety of experiences, from shopping and dining in Honolulu to surfing, scuba diving, horseback riding, deep sea fishing, snorkeling, hiking, and camping. Oahu has world-class golf courses. Honolulu is administered under a consolidated city-county form of government employing a strong mayor-council system. The mayor holds executive privileges—as opposed to mayors with only ceremonial powers—and the Honolulu City Council serves as the legislature. The city and county of Honolulu is divided into nine administrative districts, each of which elects a member of the city council. The boundaries of each district are revised every 10 years in conjunction with the U.S. census. Each district is composed of unincorporated subdivisions unofficially called towns and cities. The 2010 census showed a population of 953,207, which was essentially the entire population of Honolulu County except for a few individuals who lived in the far-flung northwestern Hawaiian Islands portion of the county. This figure accounts for about three-quarters of the state's population. As a jurisdictional unit, the entire island is in the city and county of Honolulu, although as a place name, Honolulu occupies only a portion of the southeast end of the island (essentially, the Honolulu District). People of Asian descent make up the largest group of Hawaiians (41.5 percent). Non-Hispanic whites account for 23.5 percent. The rest are Native Hawaiian and other Pacific Islanders (9.0 percent), Hispanics or Latinos (8.0 percent), blacks (2.3 percent), and American Indians and Alaskan Native people (0.3 percent). Those of two or more races make up 20.1 percent. The Asians include people whose roots are in Japan, China, Korea, and the Philippines. Oʻahu has been featured in many movies and television shows, including, but not limited to: Flight 29 Down, Hawaii Five-O, Jake and the Fatman, the Jurassic Park movies, Lost, Magnum P.I., North Shore, and Pearl Harbor. The reality TV show Dog the Bounty Hunter is filmed in the regions of Honolulu, Oʻahu (as well as other regions in Oʻahu), and the city of Kailua-Kona on the Big Island of Hawaiʻi. ↑ State of Hawaii, 2004 State of Hawaii Data Book. Retrieved December 14, 2008. ↑ 2.0 2.1 U.S. Census Bureau, State & County QuickFacts Retrieved January 28, 2012. ↑ State of Hawaiʻi: Office of the Governor. Fun Facts about Hawaiʻi Retrieved December 14, 2008. Kent, Deborah. 2008. Hawaiʻi. New York: Children's Press. ISBN 9780531185735. Macdonald, Gordon A., Agatin T. Abbott, and Frank L. Peterson. 1983. Volcanoes in the Sea. Honolulu, HI: University of Hawaiʻi Press. ISBN 0824808320. Pukui, M.K., S.H. Elbert, and E.T. Mookini. 1974. 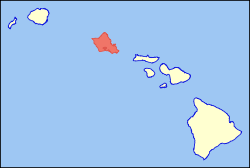 Place names of Hawaiʻi. Honolulu, HI: University of Hawaiʻi Press. ISBN 082480208X. Stanford, Emma. 2006. Exploring Hawaii. New York: Fodor's Travel Publications. ISBN 9781400016228. Photos of Oʻahu - Terra Galleria. Hawaiʻi Beaches Hawaiʻi beaches are shared by a lifelong Hawaiʻi resident through favorite ocean activities like fishing, diving, bodysurfing, bodyboarding, windsurfing, and kayaking. This page was last modified on 15 December 2018, at 16:51.